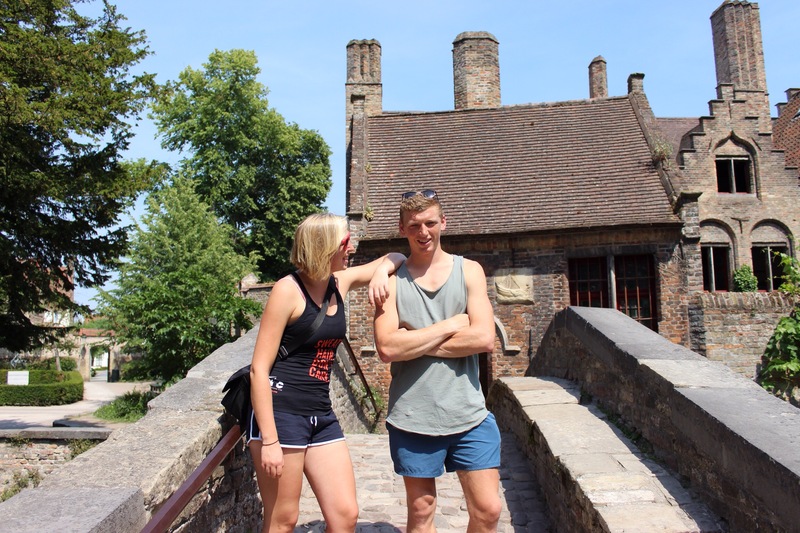 After retiring from cycling last April after the London to Paris, it was back in the saddle for a ride to the Netherlands, and the trip couldn’t have been much different. If you are looking for falls, punctures and hilarious mishaps, you need to check out here. No, this year, the sun was shining, the group was small and fair stood the wind for Holland. It was best foot forward out of Stanstead, and dad was taking no chances with the support vehicle this year. It was there for luggage and morale boosting purposes, not ferrying tired legs. Little ‘nemo’ was driven by the two aunts, the great aunts, the giggling aunts who always turned up at the end of the day with tales of escapades. A few miles in we picked up Richard, a London to Paris cyclist who sent his apologies in person by joining us for the first 20 miles. At the first break we made adjustments but we’re feeling encouraged for the journey ahead. Gran tailed us on the windy roads trying to get a good shot of us whizzing by. Unfortunately, my perfectly ripened banana did not make it as far as the lunch stop, falling out somewhere along the road. With 45 miles done, lunch was a pretty pub garden and we fuelled up for an afternoon into London, where we crossed the Thames on passenger ferry and peddled into Rochester. Bex assured us she did a 0.5, a fall which barely equated to a fall, but she was almost down. None of us bore witness to it, and her descriptions and demonstrations aroused suspicions, and left us with more questions than we started with. With the sun shining and the beautiful cobbled streets of the city, it already felt like we were on the continent. With day 1 done, we rewarded ourselves with ice cream and smoothies in the little square. There was a few dodgy tan lines and some big smiles. Lathered up in Chamois cream it was a 6.30am start to make the mornings ride. Day two was the dreaded day, firstly because last year day 2 was the most eventful, but also because it your tired body wasn’t quite broken in yet. Aiming for the 12pm ferry, we had a hilly 48 miles to make through the picturesque Kentish downs. The direction was mostly up, digging deep for the first 6 miles out of Rochester, the three of us were progressing well. (Bex had opted for the train) We had set the marker as 24 miles before breakfast but in making good progress we were flying past places before they were open. At 33 miles we stopped, running low, in Bridges for a coffee in a pub garden and as many snacks as David could swag from Londis. The rolling route through Kent was beautiful. Mastering the cycling and drinking at the same time was a feat for the country lanes, and wild flowers made the ride. On the descent into Dover we raced the traffic to get to our ferry just in time. The red line through the ferry port was an extra journey in itself, still we wound up in lane 51 just in time to see the aunts in the van perform a dubious U turn to find their loading bay. After trying out every seat on the ferry, we carb loaded and then napped as we made our way from Dover to Dunkirk. We were first off the ferry, all coaching each other with being the best right hand cyclists we could be, and battled the winds through the north of France. Almost without acknowledgement we crossed the border into Belguim. 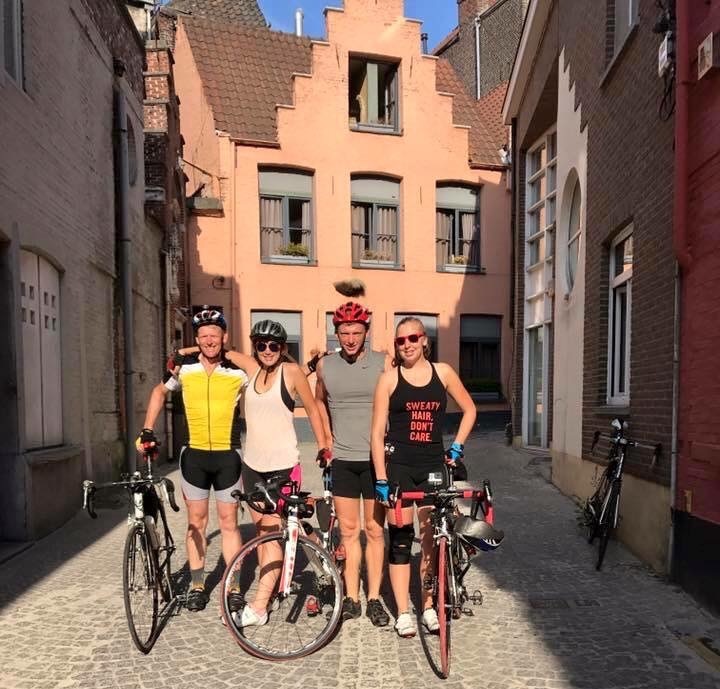 The beautiful flat countryside of summer crops characterised our afternoons ride, stumbling occasionally on beautiful towns with big churches and cobbled streets. My second banana of the trip had started its morning in England, been consumed in France, and the skin disposed of in Belgium, and all by peddle power. As we pulled up into beautiful Ypres we had spanned 83 miles and three countries, and mentally, broken the back of the journey. 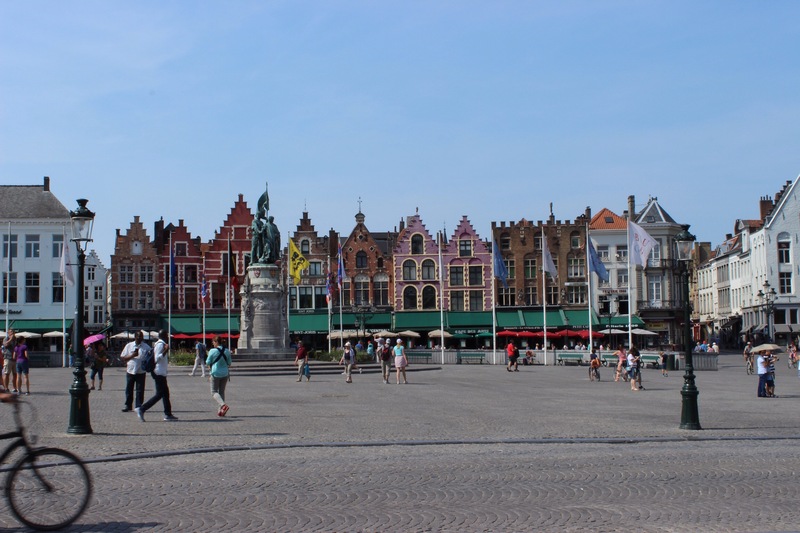 Ypres is a significant town for its tragic placement in World War One. The fields of Flanders claimed many lives and its streets were all flattened. The beautiful buildings which make up this somber town are all reconstructed and its namesake now is one of tragedy. Every night at 8pm a memorial to the soldiers lost in the fighting takes place at the Menin Gate where soldiers are named. The Last Post is played and poignancy fills the air. Still, next to the waterways and beautiful forests, there is an air of peace. The square is filled with restaurants spilling out onto the streets to enjoy the long, warm European evenings. 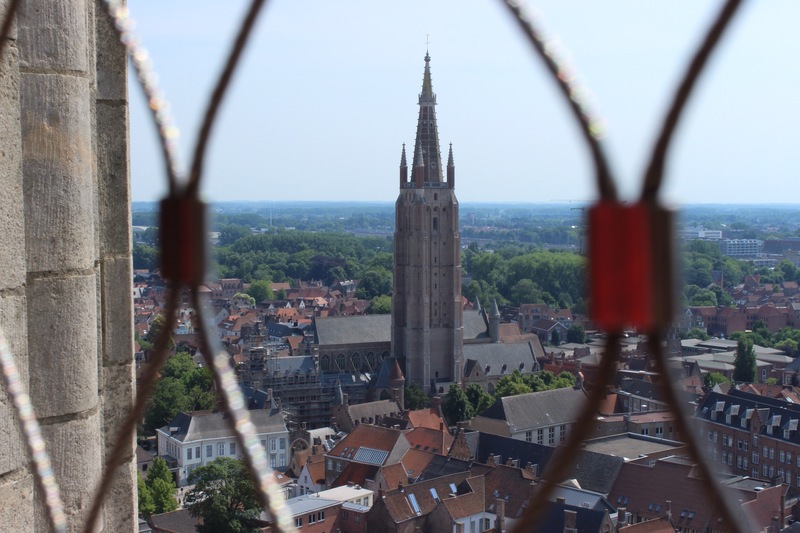 I was cautious to believe the promise of a short day, knowing that often the expectation is not always what it appears, however the middle day of the trip was to be our short day, for enjoying the goodies of Bruges. ﻿We set off in the direction of the graveyards, a mere 6 miles from the town. 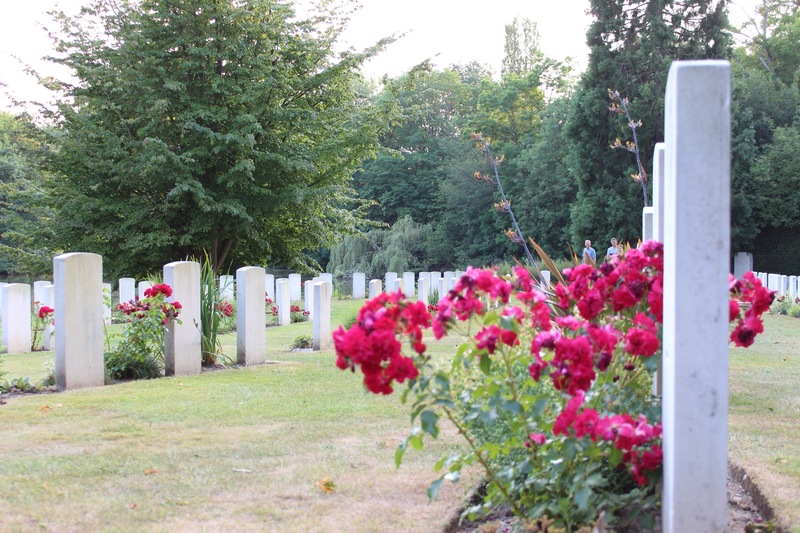 The former battlefields lay rest to 12,000 graves for 35,000 dead. British, European and Commonwealth lay side by side, some identified, many not. The splurge of colour through vibrant roses breaks up the neat rows of name stones marking the last resting place for many. Our pelitan zoomed through the countryside, David dominating the point, occasionally taking relief as someone else took the pole position. Travelling as such a close clan meant we were exceeding our expectations and tacking some impressive speeds. 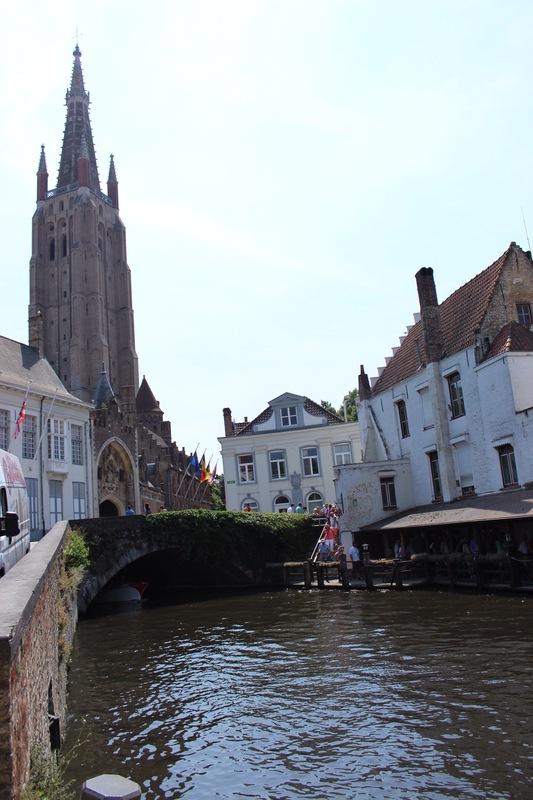 Sure enough we were in Bruges for lunchtime, and after a glass of Sangria in the sun, we set in to be sedentary. 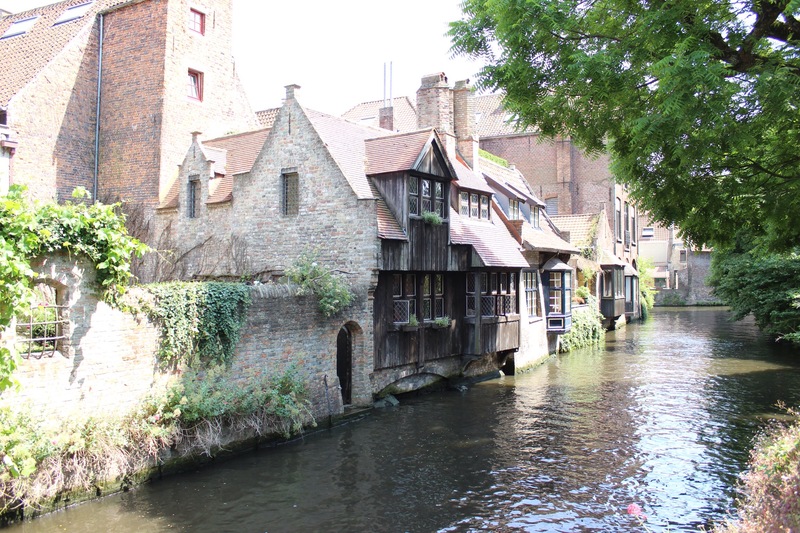 Of course the aunts had a tale of lapping Bruges roads several times, and also, presumably in envy of our journey, driving along a cycle path to get out of a predicament. 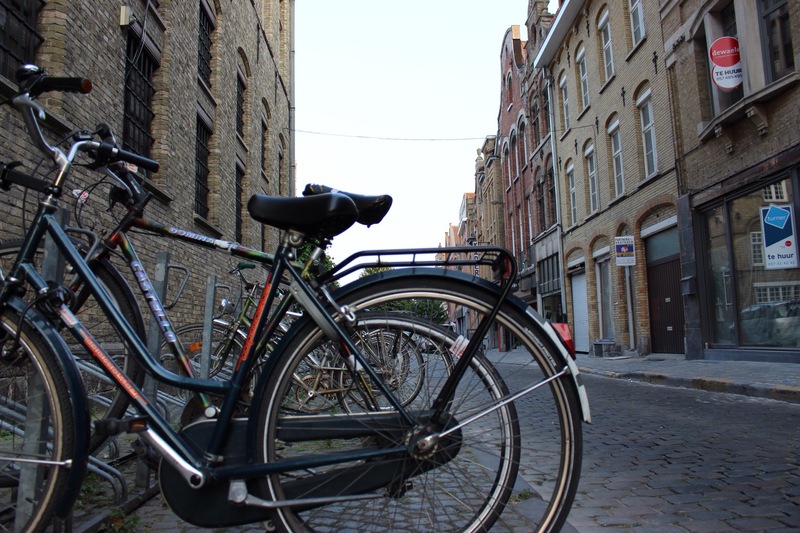 The afternoon was sweltering as we explored the old streets of Bruges. The many stone buildings surrounding the open square below the bell tower. As for our afternoon off, dad had aspirations to climb the near 400 steps to the top and stand under the grand bell as it chimed 4pm, shaking us just beneath it. Historically the theme of the bells would be changed every two years, however the townsfolk would be familiar with using it to regulate all elements of towns life, the commencing and closing of market, time for work and even natural disaster and war. 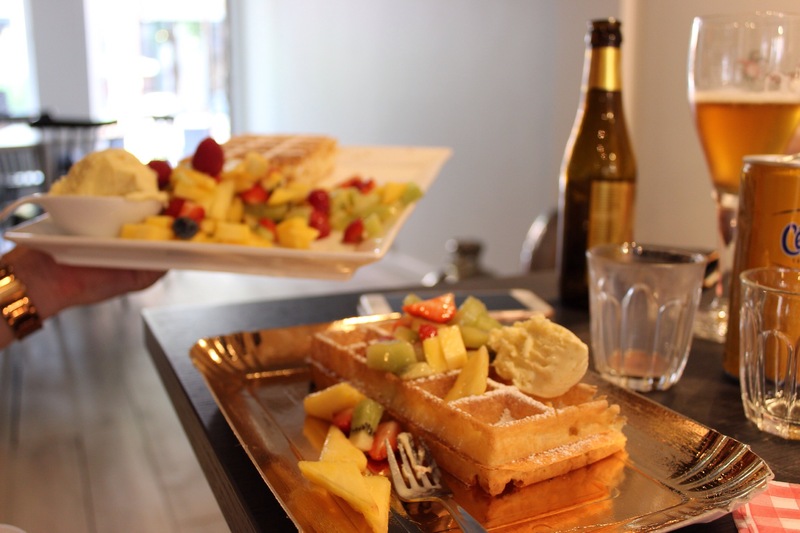 The promise of waffles was delivered, and they came bigger than your head. 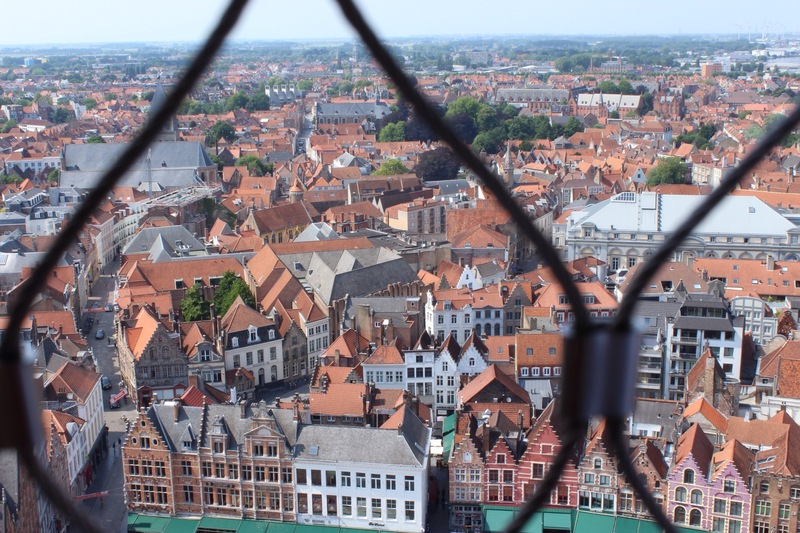 Following gorging with perusing chocolate shops, we were thoroughly spoilt with Belgian. At dinner we worked on our other kind of mussels. The kind that come soaked in white wine and served with chips, a Belgian special. On day 4 we were to taste how close we were, crossing into Holland. Leaving Bruges was the map fiasco we were more used to, but a few cul de sacs and U turns later and we were following tree lined canals northwards. Eventually the number plates turned from BE to NL and we were in Holland. We would stay close to the water all day and firstly took a passenger ferry to the islands on the west coast of the Netherlands. Packed with bikes, we bustled off the ferry with the hundreds of cyclists off to explore the beaches of the islands. The holiday vibe continued as we flew past swimming costume clad visitors and ice cream stalls. The islands, are no longer technically islands, all connected to each other by bridges which made for a psychological challenge, a mark point. We flew along through, over a two kilometre long bridge to island number 2. When stomachs started to rumble, it wasn’t apparent where the people where. We ducked off course into quiet townships, where sleepy cottages and churches nestled quietly in the countryside with little sign of life. Eventually we found a bustling settlement of Rusella and were able to stack burgers, ice creams and treats into our lunch break, people watching the Dutch holiday makers purchase body boards and blow up balls. After lunch we crossed bridge two and made our way onto the final island and raced on through, back to the mainland. The darkening sky and approaching heavy drops of rain made us realise how lucky we had been so far. In our tightly knotted formation we reached speeds of 25 miles per hour, pushing 30, and then I led the group to 32 miles per hour. At this point, David overtook and zoomed on at astonishing speed, an incredible feat of energy at the end of the fourth day in the saddle. David is best likened to a puppy, his competitive energy knows no limits. He will chase the fastest moving thing on the path, fighting to keep behind you if you overtake him, and to the surprise of the mopeds on the path, will chase them too. What clinches his position as a youthful pup is his playful head turn to judge your reaction. If he catches air over a bump he will turn back to see how you react to his rebellious act. We finished fast and just in time as the rumble of approaching thunder announced large cracks of lightening. The evenings entertainment was attempting to decipher the Dutch menu in the restaurant, David’s literal translations proving misleading. 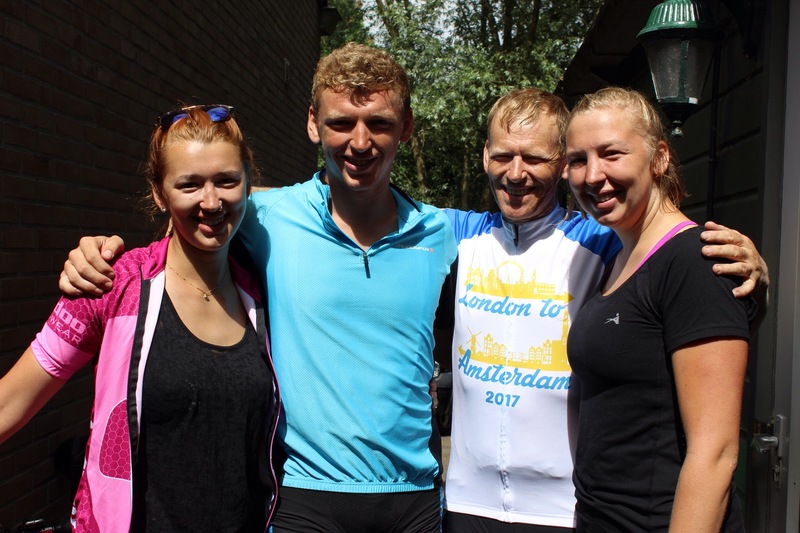 The final stretch had come fast and we were in high spirits as we set off for he final stretch into Haarlem, an outlying city close to Amsterdam. The mornings cycle reminded us that we weren’t there quite yet. We manoeuvred towns and tackled winds which made for slower progress. Our route took us underground, overground, through holiday parks with pancakes, and eventually to the Hoek of Holland. We discovered that dad was infact a camel as he didn’t appear to need to drink, convenient for the rest of us parched peddlers. The path found the coast and wound through sand dunes making for exciting cycling, a bit of undulation defying Hollands flat reputation, we emerged at Den Haag with time for a Heineken in the home of Heineken. In Haarlem we defended our stretch of road alongside the canals, counting off the final kilometres of our epic journey. After showering sweat and oil slicks off, we set off to celebrate in Amsterdam. Next How do you do, Holland? Wow, what a speed you whizzed along the lowlands at. I can imagine the scenery blurring as you zoom along. Beautiful. Food looks mouth wateringly delicious and well earned after the calorie burning journey. I now realise that my dearest second born is indeed puppy-like in his adorable temperament.